The new Oakland spot serves much more than dosas. The paper masala dosa (left) is the biggest, thinnest, and crispiest option. Anjan Mitra wants you to know that dosa by DOSA is not just a dosa restaurant. Sure, the South Indian spot serves the fermented rice-and-lentil crepes, but also curries, street food-inspired small plates, stuffed naans, egg dishes, and cocktails. It's entirely possible to dine at dosa by DOSA without ever eating a dosa. Still, you should probably order one of their dosas, which are excellent. In fact, the food at dosa by DOSA is so good that you'll want to go with a group and order as much as you can. Located in the Hive complex alongside Calavera and Drake's Dealership, dosa by DOSA arrived in December among several other chef-driven, fast-casual restaurants, including Hawking Bird, Navi Kitchen, and The Kebabery. Mitra and his wife, Emily, own two DOSA restaurants in San Francisco, which lean upscale but similarly focus on South Indian cuisine. (And, ahem, dosas.) Compared to other fast-casual restaurants, dosa by DOSA stands out for a few reasons. While the Oakland spot's menu is more streamlined than its San Francisco counterparts, it still offers an unusually large variety given the counter-service setup. 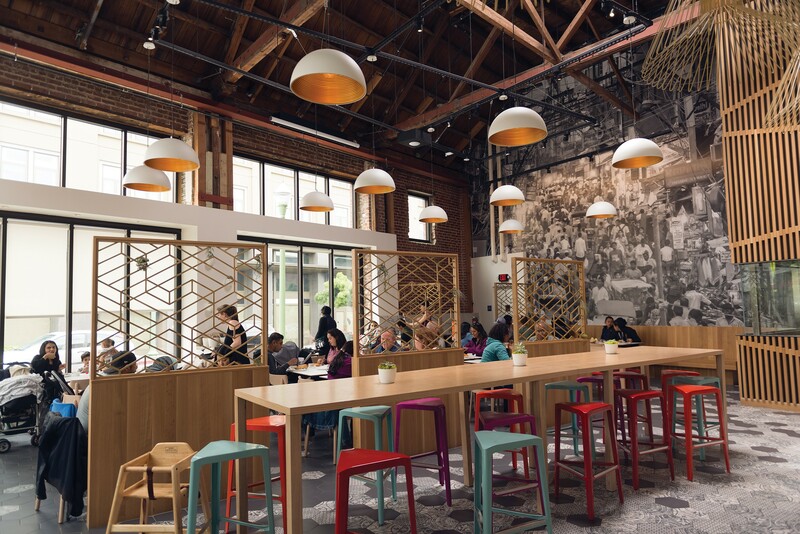 It's also the most visually stunning fast-casual restaurant I've seen in the Bay Area, with high ceilings, a marble-topped bar, modern light fixtures that resemble matcha tea whisks, intricately patterned tiles, and a sophisticated combination of white, pale wood, and copper. The occasional pop from a brightly colored stool keeps it fun, while a massive, black-and-white photograph of India's famed Chandni Chowk market nods to Mitra's roots. It's a setting that feels hip enough for date night but, given the service model, also low-key enough for a group lunch, post-work drink, or meal to-go. (The restaurant even developed its own packaging for its dosas.) The branding is beautiful and festive while also managing to avoid screaming Future Chain, with napkins that encourage you to "Be civilized. Eat with your hands." Unsurprisingly, another dosa by DOSA is due to open in Mountain View, although Mitra said he's unsure if they'll expand further. One lovely way to experience dosa by DOSA is by dropping in for drinks and a few small plates. There are spiced potato sliders, crispy samosas, and fried chicken — glorious fried chicken. A far cry from the buttermilk-brined, American variety, the Chennai chicken was boneless, light, and juicy, with a slow-burning heat. You can also order a few different stuffed naans, which were thinner and denser than what you find in most local Indian restaurants. This isn't necessarily a regional difference, Mitra explained, but his personal preference. I found the plain naan a little lacking and doughy, but enjoyed the version filled with a thin layer of remarkably flavorful lamb. The tamil lamb curry, whether served inside a dosa or ladled on top of rice, was even more explosive in flavor. I adored the richness of the spices and the sweetness from the coconut milk, and the chunks of grass-fed lamb were cooked perfectly. The butter chicken delivered as well — a strong, nuanced version of the beloved curry house staple. I was also enamored with the saag paneer, which tasted like fresh spices and cream, heightened by luscious paneer made in-house. Another main section of the menu is dedicated to street wraps. These aren't the giant, rice-and-curry-filled Indian burritos of Curry Up Now fame; rather, they offer one filling tightly rolled in grilled roti. I tried one and didn't feel eager to try another. It was sloppily executed, so foil was actually tucked inside the wrap and difficult to extract, and the prawn masala inside was a bit bland and mealy. Even though Mitra emphasizes that dosa by DOSA isn't a dosa restaurant, the fact is that the dosas are a deserving star attraction. The savory crepes were always thin and crispy, served with delicious sambar and chutneys for dipping. For the ultimate experience, order the paper masala dosa, which is extra thin, extra crispy, and extra large. The spiced potato masala — loaded with caramelized onions, cashews, and mustard seeds — comes on the side instead of inside the dosa, ensuring textural integrity the whole way through. As with most Indian restaurants, dosa by DOSA is exceedingly welcoming to vegetarians, gluten-free eaters, and even vegans. More surprising is that the restaurant serves a few salads. I felt slightly misled by the coconut kale mung salad, only because the first two words evoked imagery of, well, coconut and kale. It's much more so a sprouted mung bean dish, with a little bit of kale and coconut, in a zingy, orange-cumin dressing. Mitra explained that it's DOSA's Californian riff on a mung bean chaat popular on the streets of India — and a welcomed way to get more healthy options on the menu. A version of that salad is a mainstay at DOSA in San Francisco. In fact, many of the dishes at dosa by DOSA were featured on the menus of DOSA at some point. Since the Oakland restaurant's fast-casual model costs less to operate, though, the same items are offered at a more accessible price point. The paper masala dosa for example, goes for $9.95 in Oakland compared to $15 in San Francisco. The dining room's back wall portrays India's most famous market. The restaurant also serves breakfast, even though it hasn't quite caught on yet. On a recent weekday morning, I was the only customer — a stark contrast to lunch and dinner, where there was always a line to order. It's a pleasant, sunny place for a morning stop, though, with dosas and naans stuffed with more American combinations of eggs, cheese, and even chicken sausage. On the more traditionally Indian end of the spectrum, there's pongal, a South Indian, rice-and-lentil pudding topped with toasted cashews. Slowly cooked, the pongal took on a lovely, creamy, dessert-like consistency. It paired well with hot masala chai, ladled out of a massive pot and infinitely more delicious than the chai lattes you'll find at most local coffee shops. The beverage game is strong overall. The restaurant bottles thick lassis you can easily grab on-the-go. I loved the expertly balanced mango cardamom and the tamarind, which was gutsy in its onslaught of sweet-spicy-sour flavors. There's also sugarcane juice, wine, beer, and devilishly fun slushies. The monchichi, which buries vodka under coconut, pineapple, lime, cardamom, and nutmeg, was delicious, as were some of the spice-driven cocktails, which feature ingredients such as pickled mango, fenugreek, and fennel candy. With a separate bar area, a large communal table, and a swath of private tables, it's easy to drop by dosa by DOSA with a variety of dining styles in mind. I liked this flexibility, though it could be problematic for groups of diners who want to eat their own, individual dishes at the same time. The food arrives as it's ready, and if one station gets backed up, it can take a while. One person's rice bowl might arrive within 10 minutes, while another person's dosa could take 20 minutes, and another person's stuffed naan might take even longer. With this style, it also seems easier for dishes to fall through the cracks. On one visit, I had to inquire about a small plate that was forgotten. On another, my dessert never arrived, so I asked for it to-go on my way out. Hours: Mon.–Thu. 8 a.m.–9:30 p.m., Fri. 8 a.m.–10 p.m., Sat. 9 a.m.–10 p.m., Sun. 9 a.m.–9:30 p.m.